One- and two-person households are a growing sector in North Dakota and the United States. According to the 2000 census, North Dakota has almost 164,000 households with one or two members. The U.S. has more than 61 million one- and two-person households. They all have something in common: They need to eat! Sometimes, cooking for one or two may seem like it’s not worth the trouble; however, everyone needs a variety of foods to stay healthy. Homemade meals usually are more nutritious, better tasting and more economical, compared with restaurant meals. Nutrition and physical activity play a vital role in maintaining good health. 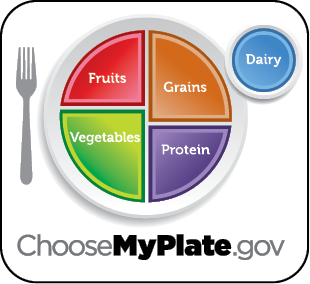 The latest U.S. Department of Agriculture food icon, MyPlate, provides individualized plans to help guide your food choices. Visit the website at Choose MyPlate.and enter your gender, age and physical activity level to print out a personalized plan. Use this guide to help plan your menus to meet your nutritional needs. • Set and eat at a table. Use your fancy glasses and dishes. • Add a centerpiece, light some candles and play some music. • Try a new recipe. • Invite a friend over to a two-person potluck. Planning makes a difference in eating healthy meals. Set a goal to plan menus for a week at a time, and incorporate your “planned-overs.” For example, making a small roast on Sunday could provide the planned-over meat for a sandwich on Monday and a vegetable beef stir-fry on Tuesday. To help plan, read your recipes ahead of time and refer to the grocery store fliers for other ideas. Organize your shopping list based on the grocery store layout. Keep a list on the refrigerator so jotting down when you need flour, sugar or other items is easy. Choose recipes that fit with your tastes and time requirements. Whether you’re a 20-something single person or an “empty nester couple” with grown children, you don’t need to throw out your favorite family recipes. You can adapt many of them to fit your current household size. • Choose recipes that are easy to divide mathematically. In recipes calling for three eggs, use two eggs and remove 2 to 4 tablespoons of liquid (if present) from the recipe. 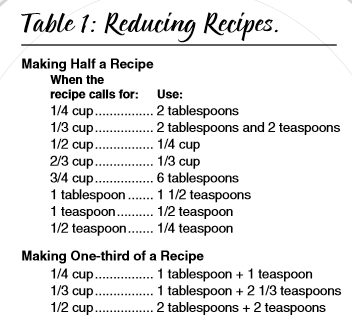 Consult Table 1 to help you reduce recipes. • If a recipe calls for a can of beans or soup and you would like to divide the recipe in half, use what you need and either refrigerate or freeze the remaining food. Label the container with the contents and date. • Add seasonings gradually. Sometimes you may need to add more (or less) of the spice to reach the desired flavor. • Check for doneness of halved recipes five to 10 minutes sooner than the original recipe. • Keep notes about what works — and what doesn’t! Keep some time-saving ingredients available, too. Consider purchasing prewashed, precut fruits and vegetables if that fits your budget. While usually more expensive than buying the whole product, they may be in more convenient amounts for your needs. Frozen or canned fruits and vegetables are other options available in containers of various sizes. Prepared pasta sauce, boneless chicken breasts and frozen bread dough are “speed scratch” ingredients that can make “homemade” meals fast to prepare. Frozen vegetables and chicken breasts allow you to use just what you need, too. Most grocery stores carry thousands of items. While at the grocery store, try these tips to reduce time and choose nutritious items. • Shop during off-hours. Try not to shop while you’re hungry because you might be encouraged to add extra items to your cart. • Consider buying items in bulk if you can repackage and store the items. Items such as fruit may spoil before you can eat it all. • Compare Nutrition Facts labels to get the most nutrition for your money. • Compare “unit prices” on foods. Sometimes the item that has the lower unit price isn’t the “best deal” if you tire of the food before you use it all. You also may want to bring a calculator to help compare prices. Baking, broiling, steaming and stir-frying are examples of heart-healthy cooking. Try using cooking spray instead of shortening to grease pans. Make a one-pot meal by adding vegetables to cooking meat and pasta. Save time by cooking items in a microwave or by steaming. Making family-sized recipes can provide you with leftovers for future meals. Freeze the remaining food in meal-sized containers. Be sure to label the containers with the contents and date to avoid “surprise meals” later! What if you don’t like “leftovers”? Consider them as “planned-overs” and try them in completely different recipes. For example, add leftover fruit to muffin, quick bread or pancake batter. Freeze planned-over vegetables and use in stews, soups and other dishes. Use extra bread to make French toast, bread pudding or stuffing. Use planned-over meat in tacos, soup or stir-fry, or on salads. • Use planned-over macaroni to make pasta salad or quick casseroles. Add planned-over vegetables or meat. • Make minipizzas by topping English muffins with planned-over spaghetti sauce, vegetables and shredded cheese. • Add chopped onions, mushrooms, peppers and cooked meat to canned spaghetti sauce. Serve spaghetti sauce over noodles one day, then add kidney beans and chili seasoning for another meal. • Top a microwave-baked potato with planned-over chili and cheese. • Mix chopped yellow squash, green peas and grated carrots with a prepared rice mix. • Spice up canned tomato soup by adding chopped green onion, celery and some garlic powder. For more information, visit the NDSU Extension Service website.